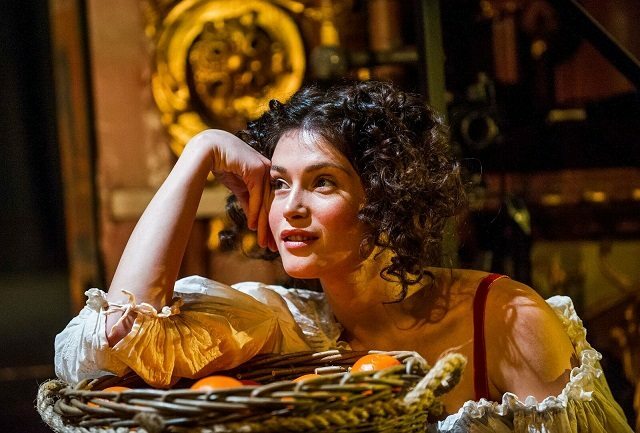 Jessica Swale’s play Nell Gwynn was a big success for Shakespeare’s Globe last autumn, so it is of little surprise to see it transfer to the West End in the superb production directed by Christopher Luscombe. Full of warmth and real wit, an intelligence about the role of women in theatre and a truly sparkling lead performance from Gemma Arterton (who takes over the role from Gugu Mbatha-Raw), the result is one of the best nights currently to be had in the West End. Set during the reign of Charles II, Nell Gwynn is a true rags-to-riches story – tracking her rise from a Covent Garden orange-seller to the heights of the Royal Court as she became a favourite of the King and bore him sons, not to mention the small feat of becoming one of the first women to ever act upon the stage. So Swale gives us a dual love story – Nell and spaniel-loving Charles falling for each other in a real love match and the power of the theatre working its magic over all and sundry. Arterton and David Sturzaker are ideally matched – her powerfully flirtatious manner is a breath of fresh air for a man used to absolute deference, and the cheeky games they play are a delight to behold, especially when she is expressing her dissatisfaction, especially when it comes to hats… The theatre company she works with provide huge amounts of comedy as they banter about what changes having women on the stage might bring and deal with the upheaval of Nell’s rising fame. Greg Haiste’s Edward Kynaston is brilliant as the former female lead who now finds himself reduced to one-line bit-parts (because how could a play have two decent roles for a woman?!) and Michele Dotrice is hilarious as Nell’s scene-stealing dresser. Nigel Hess’ musical compositions provide unexpected but superb musical interludes that fit in perfectly, and Hugh Durrant’s set design is lavish and luscious in suggesting the richness of life both behind the curtain and behind the throne. A theatrical triumph for all concerned – Arterton continues her progression into one of our finest stage actresses and Jessica Swale breaks through as a writer to watch out for.